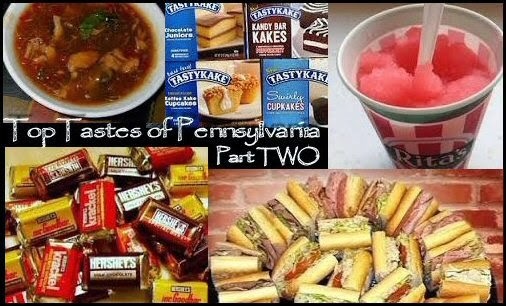 Here is Part Two as we continue our tasty tour of Pennsylvania and take a look at more foods that have their start or significant history in Pennsylvania. If you haven't checked to out, start with Part One. We'd love to hear about your favorites, or maybe a taste we forgot to add - or we have not had yet. Let us know in the comments section at the end of this post. If you've already read Part One, let's continue our foodie tour of Pennsylvania. The term "hoagie" originated in the Philadelphia area. In 1953 the Philadelphia Evening Bulletin reported that Italians immigrants working at the World War I era shipyard in Philadelphia,called Hog Island, introduced the sandwich. By putting various meats, cheeses, and lettuce between two slices of bread. this meal became known as the "Hog Island" sandwich; which shortened to "Hoggies", then finally to the sandwich we love - "hoagie". Wawa - a chain of regional convenience stores that makes a good, quick hoagie. They use touch screens during the order process so you can personalize exactly what meats, cheeses and toppings are on your sandwich. Primo Hoagie - this sandwich shop with multiple locations uses a delicious sesame seeded roll. Lee's Hoagie House - Another local chain that features a unique hot pepper spread. Many people forgo the chains and prefer the personality and nuances of their neighborhood mom and pop sandwich shops. Check this comprehensive list of hoagie shops in the Philadelphia region. It's true, you don't have to go to Pennsylvania to get the milk chocolate goodness of this candy maker known around the world. But something special can happen if you point your RV toward Hershey Pennsylvania and stay a few days in the town where it all began. The story of "Chocolate town, USA" has it's beginning in the humble man that the town and company are named for. Milton Hershey's legacy needs to be experienced to truly understand what he did for this Pennsylvania region as the "King of Chocolate". Besides candy, why not try a Chocolate Martini? How about experiment in the Chocolate Lab and make some of your own chocolate masterpieces? Or, you can quite literally be immersed in chocolate at the Spa in Hershey PA. We've been asked to be a guest blogger for the near future on an RV industry blog with tips about RVing to Hershey - we'll let you know when that's posted! Till that happens, to learn more about Hershey, check into The Sweetest Place on Earth. From its fabled roots in the American Revolution, the Pennsylvania pepper pot is not as well know but still is a long-standing tradition in the region. The main ingredient is beef tripe, which is the inner lining of the stomach chambers of a cow. Originally made by farmers frugal "waste not, want not" mentality, this beef tripe and vegetable stew is flavored with root vegetables and a lot of pepper. Often it has a tomato base to the broth. Farmers sold the pepper pots to the Revolutionary War soldiers from street carts as a way to make some extra money. Philadelphia Pepper Pot soup was served and enjoyed by President Kennedy when he attended the Army Navy Game in 1961. It's popularity soared and was made into a canned soup by the Campbell Soup Company. Andy Warhol lampooned the canned soup in his piece Small Torn Campbell’s Soup Can (Pepper Pot). Growing up in grade school in Philadelphia, we'd hum the jingle "Nobody bakes a cake as tasty as a Tastykake" because we heard it so many times during our favorite Saturday morning cartoons. Established in 1914 by Philip J. Baur and Herbert T. Morris and originally selling its goods only in the Philadelphia metropolitan area, the company now distributes its products up and down the East Coast, south to Florida, and is expanding it's cakey goodness across the United States. Tasty Baking Company may be a baker of mass produced goods created in a factory, but they are still delicious. For over 100 years they have provided some unique dessert items that both kids and adults love. Butterscotch Krimpets are white cake with a thick layer of butterscotch icing. Tandykakes had the tri-force flavors of chocolate, peanut-butter and firm buttery cake. Coffecake had a crumbly topping. Jelly Krimpets and filled cupcakes had sugary fillings injected into their middles. Mini single-serving pies (Which they make over 250,000 daily) are one of my favorites. Besides these staples, Tastykake also creates seasonal goods, and family packs of donuts and other goodies. 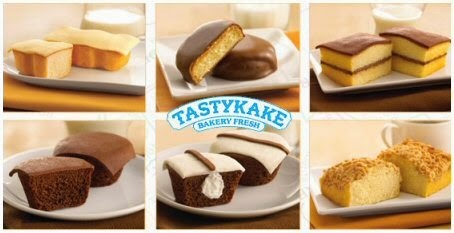 Check out www.tastykake.com for more information. "Wooder Ice" in Philadelphian parlance is a flavorful concoction of various flavored ice and sugar. It is made similarly to how ice cream is made by freezing the ingredients as they are being mixed. It's consistency is of fine ice crystals rather than the larger rough crystals of a of a slush puppie or slurpee. The consistency is also different than shaved ice or a snow cone. Traditional Water Ice has fruit flavors, with a few places that will have root beer, chocolate, or bubble gum in their taste repertoire. One company is the "big name" in water ice and has changed the idea of a neighborhood water ice stand forever, giving customers a whole new experience. 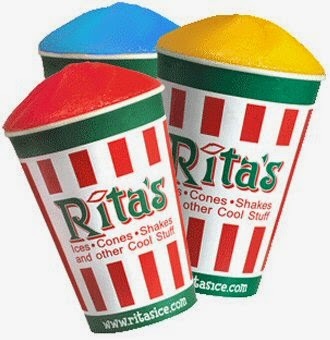 Former Philadelphia firefighter Bob Tumolo founded Rita's Water Ice in 1984. Tumolo purchased the initial recipe from an elderly neighbor, and started experimenting and enhancing the recipe with different flavors, and real fruit.The success of the business allowed Tumolo to open another location within three years, and soon after he and his family decided to franchise the company. Rita's Water ice now includes partnerships with candy makers that allow new flavors like Swedish fish or sour patch kids. Local franchisees continue to support local non-profit organizations and charities by working with the organizations and having a special day or time frame they donate a percentage of the sales. For one of the neighborhood places to get "wooder ice", check this comprehensive list of Philly favorites.